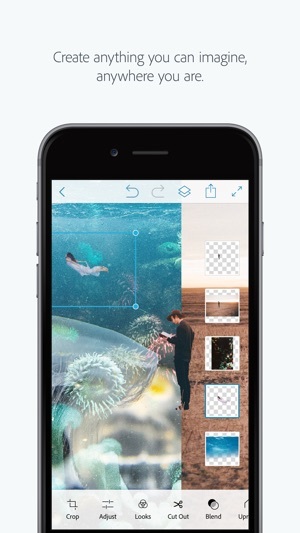 Use the official Adobe Photoshop Mix app to easily create and share professional multilayered images and designs in minutes. 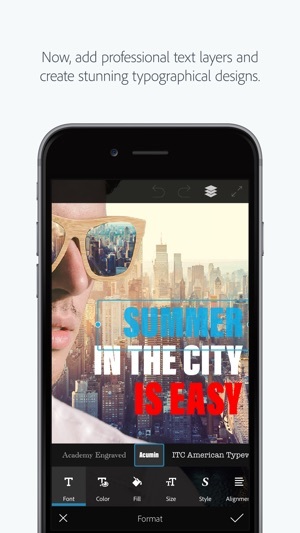 New feature: Now, add text layers to create stylish typographical designs for everything from Instagram to Invitations. • Combine multiple images/layers to dream up something truly magical. • Easily remove or replace any object (people and things). • Selectively retouch and fix flaws. • Quickly share with friends or post to social. • Send to Adobe stock and sell your media to the world’s largest creative community. • Experiment with different blend modes and fill opacities within each layer until you get the look you want. Mix includes some of the most popular blend modes from Photoshop CC. 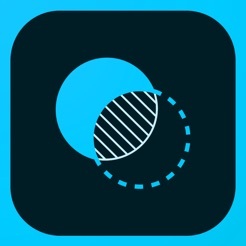 • Adjust colors and contrast or apply preset Looks​ (filters) to your pictures. Enhance the entire image or just a portion with the touch of your finger. • Nondestructive editing means your original images stay pristine and untouched. 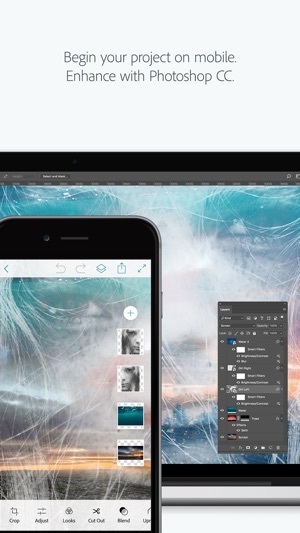 • Take your mobile project to the next level with Adobe Photoshop CC. 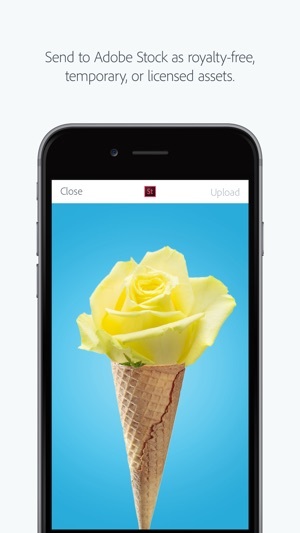 The world's best imaging and design app is at the core of almost every creative project. Work across mobile and desktop to create and enhance your photographs, designs, artwork, videos, and more. Love photography? Check out the Creative Cloud Photography plan. It gives you Lightroom and Photoshop, the most powerful editing tools around. With Creative Cloud, you can open and edit Photoshop files in Mix and send compositions to Photoshop CC for further refinement — layers, masks and all. Open and mix Lightroom images and send directly to your Lightroom Collections. And move images between Mix, new Photoshop Fix and Lightroom for mobile for a complete mobile editing experience. Creative Cloud also lets you use Photoshop CC features in Mix, including Shake Reduction. And all your edits are synced across all your computers and devices. Make a change on you iPad, it’ll show up on your desktop. Take your photography further with the Creative Cloud Photography plan. • Photoshop Fix — Edit facial features, heal, lighten, liquify, color and adjust your images to perfection — and then easily share them across other Creative Cloud desktop and mobile apps. 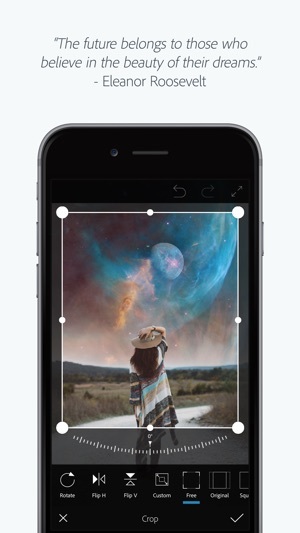 Photoshop Mix is the most complete, feature-rich photo editing app available for your phone today. 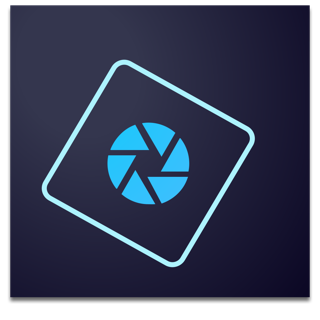 It's got a jaw-dropping array of capabilities, and if it's not enough, you can import your photo to another Photoshop app, use the tools there, then bring your photo back into Photoshop Mix to finish. Amazing! The app is not too difficult to use, but there is a learning curve. It is more for people who want a lot of control over their photo edits. There are simpler apps out there that let you combine photos fast, but none better for people with exacting standards who want their photo project to come out beautifully. I haven’t used this app much to give a very official review, but I will revise this when I’ve used this a bit more. I’m a very active member in my little groups of online buddies and one thing that I used a lot on my Samsung was the lasso crop tool in the default photo editor, and frankly I thought I would never be able to recreate what I used to on an IPhone. But this app has reopened the ability for me to create quality content on a mobile devise instead of using photoshop on a computer which takes a while longer with my process. The main issue I found was that the brush resizer or area selection was entirely dependent on how zoomed in you were on the image which limited mobility. Would’ve liked a bar to resize the selection radius or at least the sensitivity of color selection because zooming in and slowly Rotoscoping my image was a pain but I can’t argue with results. Would like to see options for tools rather than just a deslect and a select option. I really enjoy this app for editing photos, but there’s a few issues. The first issue is that sometimes when i insert a photo, it will appear with vertical lines going through the image, maybe it’s just the images that i use but i’m not sure. The other issue is that i can’t have more than 10 layers on one project. I would also like it if there were more fonts and the ability to use the pick color tool on color layers. Otherwise this is a 5 star app. I highly reccommend this to anyone interested in learning photoshop.